Spheriscan is a revolutionary scanner with a modern twist. The Spheriscan’s pan rotation does not have an end-stop: its mirror goes on turning endlessly beyond 360 degrees, which creates an absolutely original swirling effect. Its speed may be adjusted as desired and reach a maximum of 250 rpm, that is more than four revolutions per second! Spheriscan is without a doubt much more powerful and brighter than any of the other scanners that came before it. 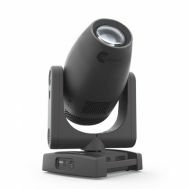 Its spanking new OSRAM lamp works at 1200 W.
Spheriscan features a 13°-34° high speed zoom, 1 rotating gobo wheel with 6 gobos, 1 fixed gobo wheel with 8 gobos, a rotating prism, a fast sixteen-blade iris, a linear frost filter, CMY system, a 7-color wheel. A RGB system, built into the top head, turns it into a glowing transparent dome. Three dedicated DMX channels allow for unlimited colors. 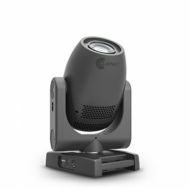 Spheriscan is built to be used outdoors (IP54). Using a special optional support system, Spheriscan may be recessed into the stage floor, with only its transparent head visible, to create original gazing projections. Lastly, you can also use the Spheriscan to project light directly, without the mirror (SPHERILIGHT configuration). Spheriscan is therefore a tribute to the past with an endless variety of state-of-the-art technical features. It is a powerful effects light capable of adding a new distinctive touch to shows and an appliance you can use on many occasions, including big events, indoor and outdoor concerts and architectural installations. Electronic monitoring with status error. DMX level monitoring on all channels. Firmware Upgrade with no power. Firmware upload from another fixture.